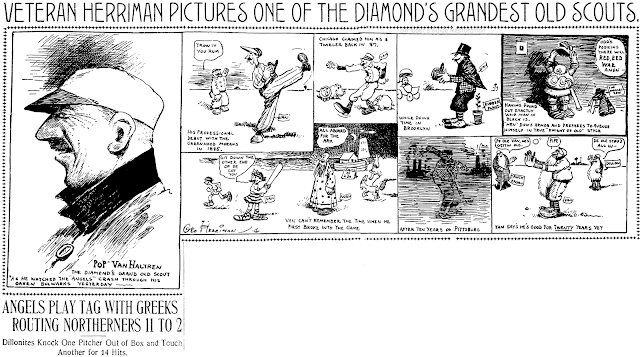 Thursday, April 9 1908 -- Herriman decides to profile one of the Hen Berry's gang o' nine today, after watching the Angels plaster Oakland 11 to 2 in a sloppily played contest. He chooses George Van Haltren, who had a long and impressive career in the majors before 'retiring' to the Pacific Coast League. Herriman has one fact askew here -- Van Haltren actually played for the New York Giants for a decade -- with the Pittsburg Pirates he spent only two seasons. 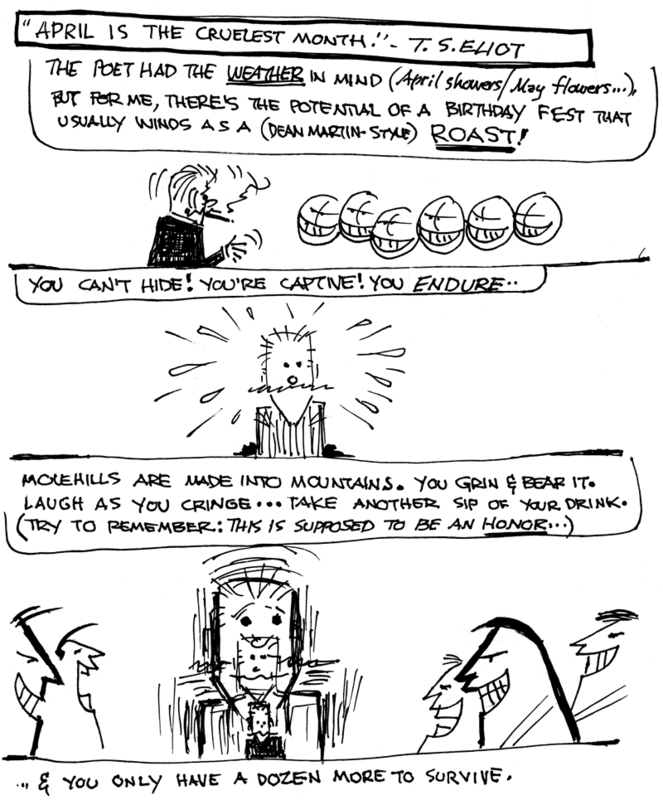 Here's a good, if short, recounting of his career. It's a bit surprising to me I've never heard of this fellow, who still holds the National League record for consecutive games reaching base safely -- 60 games! In weazel skin hat news, Hen Berry prepares for open battle! 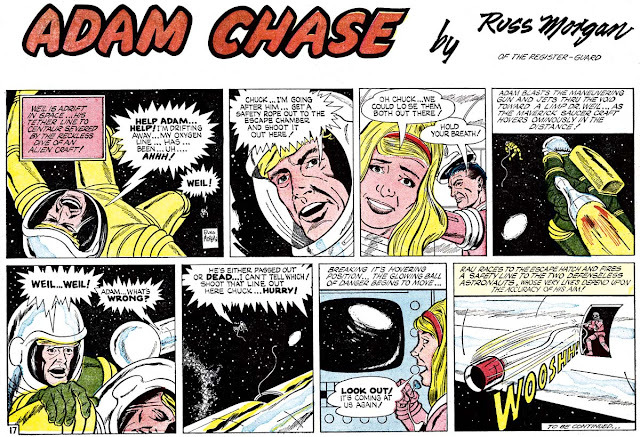 Adam Chase strip #17, originally published September 25 1966. For background on the strip and creator, refer to this post. Look at that mini microphone that she is atlking into. In 1966 they had nothing like it. Quite a smart SF extrapolation! What Sort of People Read Hearst Papers? 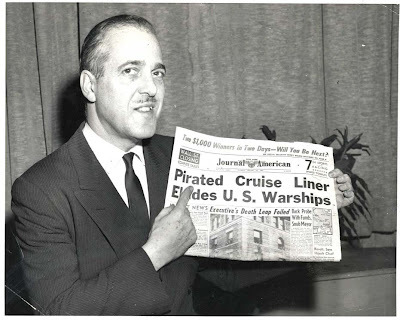 Lee Falk holds the January 24, 1961, issue of the New York Journal American. The reason for this photo is that the current Phantom storyline mirrored reality when terrorists took over a Brazilian cruise ship. 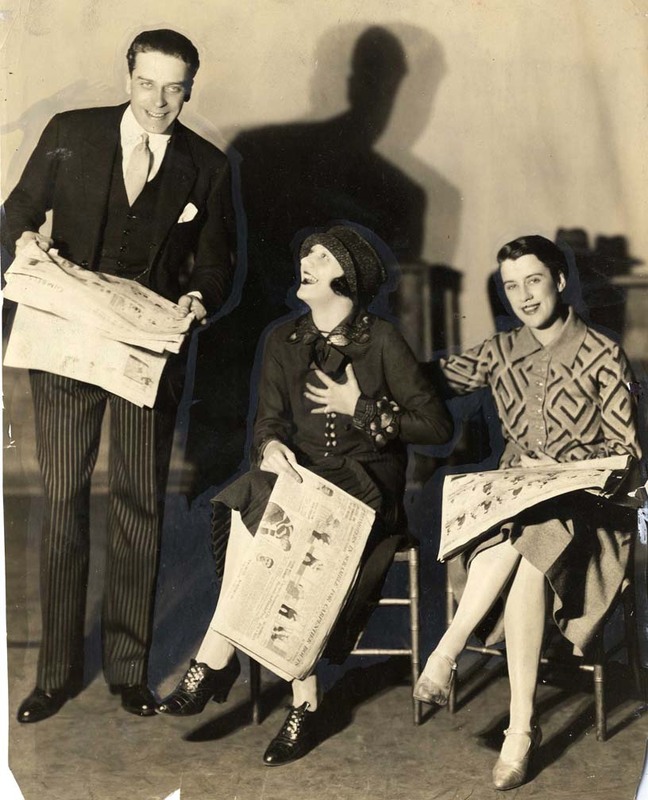 English musical comedy stars Jack Buchanan, Gertrude Lawrence, and Bea Lillie enjoy the New York American comics, circa 1927. William ("Hopalong Cassidy") Boyd enjoys a copy of the December 27 1950 issue of the Los Angeles Examiner. His comic strip would be jumping to that paper from the Mirror one week hence. 1950s TV star and game show host Garry Moore on the set of his early, local daytime show, with a copy of the New York Journal-American, 1950. 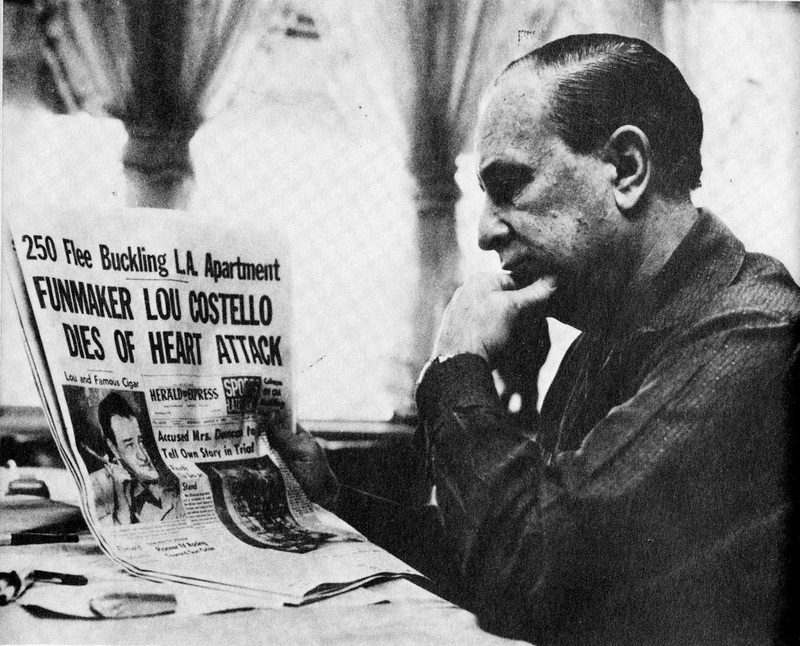 Bud Abbott reads about his ex-partner Lou Costello's death the day before in the March 4 1959 issue of the Los Angeles Herald-Express. 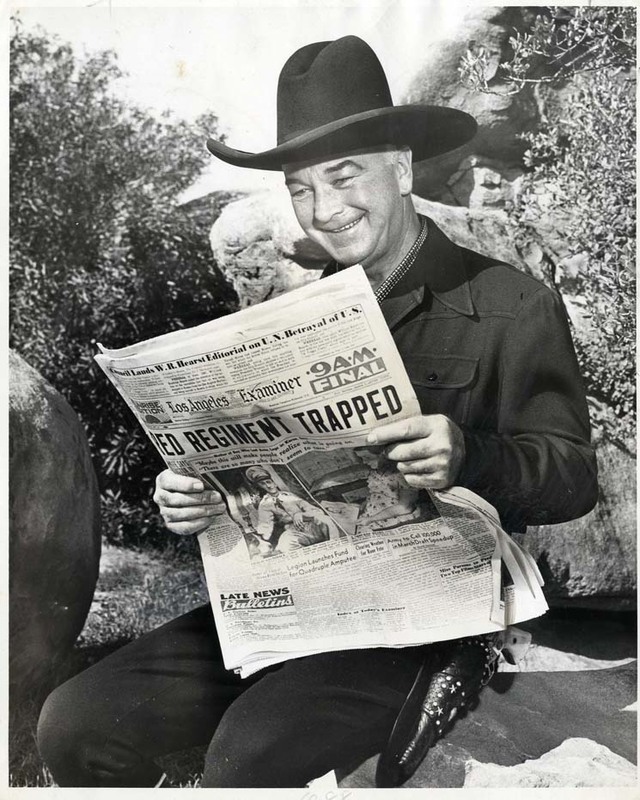 Hopalong Cassidy: The Comic Strip ought to make a great Obscurity of the Day feature!!! Raymond Irving “Ray” Hoppman was born in New Haven, Connecticut on April 6, 1887, according to his World War I and II draft cards. Information about his education and art training has not been found. In the 1900 U.S. Federal Census, he was the youngest of four children born to Frederick and Katharine. His father was a preacher. The family lived in Dunkirk, New York at East 4th Street. In 1910 the Hoppmans lived in Irvington, New Jersey at 6 Howard Street; his mother had passed away earlier. Hoppman was a commercial artist. He was employed at the New York Evening Telegram as early as 1914; that year his cartoons were copyrighted by the newspaper in the Catalogue of Copyright Entries, Part 1, Group 2: Pamphlets, etc. 1914, New Series, Volume 11, Numbers 7 and 8. The Judge, in its July 21, 1917 issue, reported the fifteenth annual convention of the American Press Humorists at the McAlpin Hotel in New York City. Among the new members elected to the group were Hoppman, Irvin S. Cobb, H.T. Webster and E.A. Bushnell. Hoppman signed his undated World War I draft card. He lived at 614 Nye Avenue in Irvington, New Jersey. His occupation was cartoonist at the New York Evening Telegram. His description was “5 ft 10 in, slender, gray eyes, light brown hair.” In 1919, he married Harriet, according to the 1930 census, and his Famous Fans panel began. Hoppman and his wife lived in West Hoboken, New Jersey at 447 Clinton Avenue, as recorded in the 1920 census. He was a cartoonist for a newspaper. He produced a number of comics in this decade including Hank and Pete, Make-A-Comic, and Assorted Nuts. In 1930 Hoppman lived in Dumont, New Jersey at 100 Randolph Avenue. He was a cartoonist for a trade publication. A Google search found a contents page with an article or cartoon titled “Slinging the Paint by Ray Hoppman” in a 1931 issue of the National Painters Magazine (Painting and Decorating Contractors of America). He produced the strip, Don't Be Like That! (1935-1937), for the Van Tine Features Syndicate; he held the copyright according to the Catalogue of Copyright Entries, Part 1, Group 2: Pamphlets, etc. 1935 New Series, Volume 32, Number 9. His address and occupation was the same in the 1940 census which showed that he had two years of high school education. (The census enumerator mistakenly recorded Hoppman’s first name as Morton, which was his neighbor’s name.) A Google search found a volume of the trade publication, The Progressive Grocer (1941), with this snippet of news on page 159, “Illustrations for these advertisements are drawn by Ray Hoppman whose work appears regularly in the editorial pages of The Progressive Grocer.” Hoppman signed his World War II draft card on April 25, 1942. According to the card, he was self-employed. One of the more interesting side roads in the annals of 20th century newspaperdom is the saga of Cornelius Vanderbilt IV. 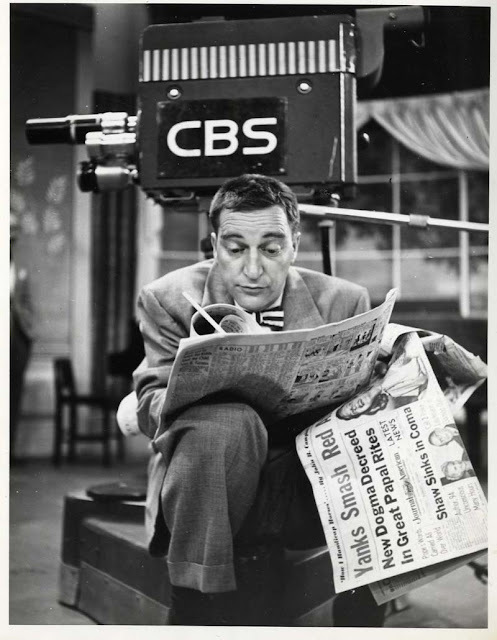 He was born into the hyper-wealthy Vanderbilt family, but was ostracized by them for his interest in journalism. The Vanderbilts, frequent targets of reportorial skeleton-rattling, hated the press, and when young Vanderbilt decided to get into that business the family shut him out of their lives almost completely. 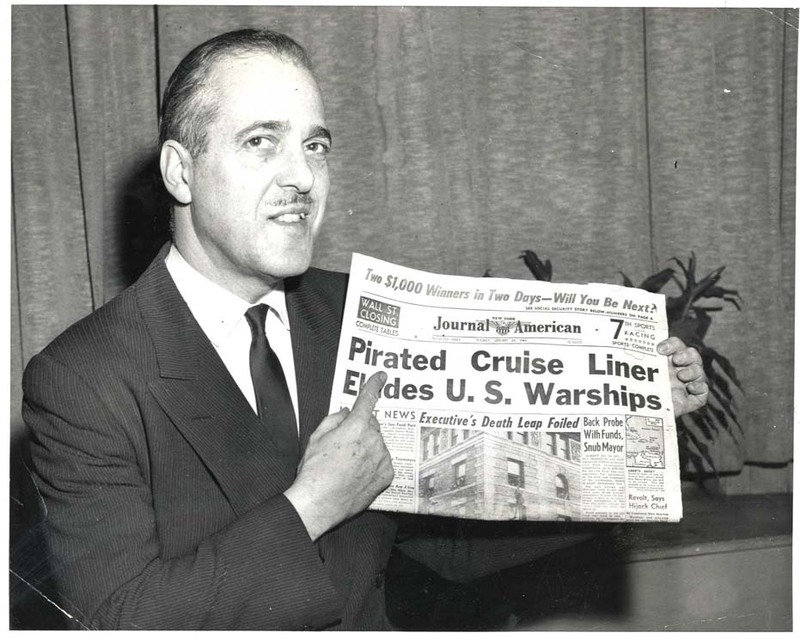 Vanderbilt fancied himself a crusader, and his papers tiptoed a fine line between muckraking and plain old sensationalism. Vanderbilt quickly created enemies for himself and his papers, and the newspapers found it hard to sell advertising space. Not only that, but as new kids on the block in San Francisco, Los Angeles and Miami, the Vanderbilt papers found it nigh impossible to purchase syndicated material. That brings us to the CV Newspaper Syndicate, which was created in an attempt to offset the cost of having to generate comics and columns in-house for the papers. Unfortunately, though the CV Newspaper Syndicate actually had some rather intriguing material on offer, there were few if any takers. The newspaper fraternity was not interested in doing business with the young upstart. Today we focus on Ma by Ray Hoppman, one of CV's offerings. It's not a classic by any means, but Hoppman had a knack, in my opinion, for writing genuine, warm and realistic humor about his typical American family. The art is adequate, though one has to wonder about some rather odd details -- Ma and Pa's eyeglasses look like they might be predecessors of the X-Ray specs advertised in comic books, and daughter seems to live in a perpetual high wind, her head looking like a radiator cap ornament. Hoppmann definitely had talent, but he usually worked for second-tier and low-rent operations like CV. Perhaps he had personal issues of some sort. We'll get to know Hoppmann a little better towmorrow, with Alex Jay's Ink-Slinger Profile. Pinning down the running dates of Ma is tough, because the Vanderbilt papers are mostly, or perhaps even completely, unavailable on microfilm as far as I know -- a real tragedy. What we can piece together is based on a few bound volumes and loose issues in collector's hands. We think the strip began in May 1923 (this from a Fourth Estate piece), and ran at least until July 1924, based on L.A. Daily News issues owned by Cole Johnson. Horace Taylor was born in Nokomis, Illinois on October 7, 1865. His birthplace was mentioned in the Inland Printer, April 1896, and his birth date was in the Alumni Record of the University of Illinois at Urbana (1906). The 1870 U.S. Federal Census recorded the Taylor family in Greenwood, Illinois. He was the youngest of five children born to George, a farmer, and Margaret. In 1880 they resided in Nokomis, Illinois, where Taylor’s father was a banker. No artist in the country is more thoroughly acquainted with, and proficient in, every branch of the newspaper illustration than is Horace Taylor. He was born in Nokomis, Illinois in 1865, where he received his elementary education and became familiar with those homely country characters which of late he has been so successful in depicting. From 1882 until 1887 he was a student in the University of Illinois, the last two years of which time he acted as assistant instructor in perspective, of which subtle science he is a master. On graduating from the university, in 1887, he came to Chicago, and after a short set-to with the designing of labels for tomato cans and cracker boxes, he joined the art staff of the Daily News, now the Record, under the veteran and able Schmedtgen. 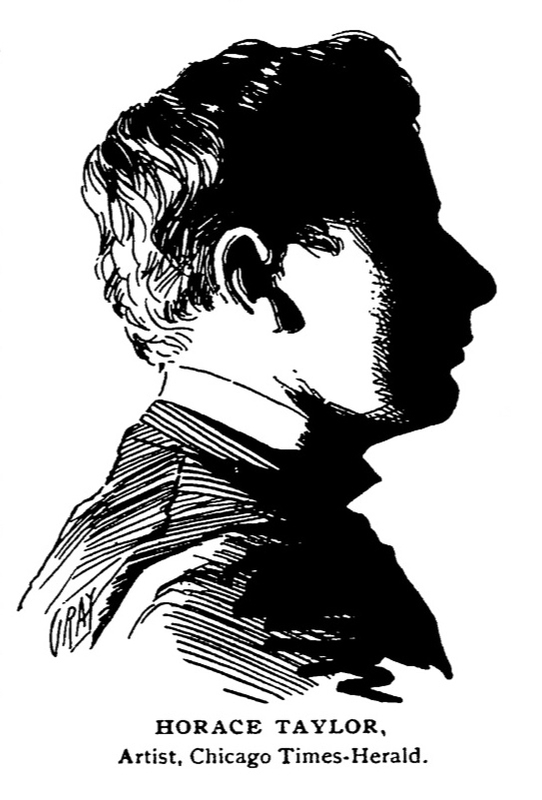 In less than a year, however, he went to the Chicago Herald, with which paper he has worked steadily through all its changes of management and name, up to the present time, excepting a few months, some years since, when he and Tom Powers deserted to adorn with colored cartoons the pages of the short-lived but brilliant Light, that failed. Taylor’s works that have attracted most attention have been those appearing in series or groups, such as the “holidays” and “seasons,” shown about two years ago; then the studies of village character, which ran for quite a time, and were noticed and copied by many papers both in the East and West. Later the Egyptian friezes made their appearance on Monday mornings, archaeologically correct and brimful of humor, the best things in this line that have been done either by the daily or weekly press. The last few weeks, however, we find him taking up an even more original line in the connecting of the prehistoric man of the stone age with comedy of everyday life of the present. Taylor is a diligent worker, and during the week makes many happy hits. His cartoons are copied by the largest papers, both in America and across the water, and his future is assured. …Taylor’s contributions were nearly as numerous as [Thomas E.] Powers. An Illinois native, Taylor was twenty-four when he began contributing to Light. He was a fine caricaturist and drew many of the magazine’s best political cartoons. Of all those who worked for Light, his future appeared brightest. Taylor’s career as a cartoonist reached its apex at the end of the century when he drew memorable chromolithographic cartoons savaging McKinley and Roosevelt for the New York weekly, The Verdict. For the remainder of his career, he worked as a cartoonist and illustrator for a variety of New York newspapers and magazines. The Alumni Record said he worked at Chicago Daily News and Record from 1887 to 1889; the Chicago Herald from 1889 to 1896; the New York Journal from 1896 to 1900; and The Verdict, from 1900 to 1902. Taylor married Laura A. Gibson, February 4, 1895, in Chicago, however, at Ancestry.com, the Cook County, Illinois, Marriages Index, 1871-1920, said they married on the fifth. …It was founded in 1887, and first had rooms back of Henry Coster’s saloon in an alley near the chicago News building. It soon gathered unto itself all the clever men of chicago who were writing for newspapers, and a few of their intimate comrades in other lines of work but of sympathetic spirit…. According to the Artistic Guide to Chicago and the World’s Columbian Exposition (1892), Taylor was on the Whitechapel Club’s board of directors from 1889 to 1890. He, Powers, and J.T. McCutcheon were some of the artists represented in the fourth annual black-and-white exhibition of the Chicago Society of Artists as reported in the Inter Ocean, February 20, 1892. Three years later, the Inter Ocean, March 17, 1895, singled out Taylor and McCutcheon’s work in the annual show. The Midland Monthly, November 1895, featured an article on newspaper illustrating with drawings, by Charles A. Gray, of several artists including Taylor (top). The first “annual” exhibition of the Press Artists’s League was begun with great eclat last night in the east parlor of the Waldorf. The most charitable thing that can be said of it is to add your small voice to the majority, and devoutly hope that it will be the last…Among the cartoons Horace Taylor also shines in color. His few exhibits are above par, and will surprise even those who have enjoyed his clever newspaper drawings. ..I consulted a real estate friend of mine and told him I would like to build far from the madding crowd. He suggested Pompton, N.J., Leffert’s Park, and finally the place where Horace Taylor and Ray Brown live, up the Hudson, but I told him two artists in one community was quite enough…. …I want all newspaper artists to feel at home, and so I will have a long line of lockers with private keys where they can keep their collars, pencils, pens and cardboard. Thus far I have assigned lockers to James Swinnerton, Tom Powers, Charles Reese, Horace Taylor, Willie Williams, Frank Nankiveil, the Brothers Glackens, Mike O’Flaherty, E. Fredericks, Harry Dart, Charles Wright, Percy Gray and William Jennings Bryan Weil….I will paint the house myself, being assisted in this task only by Paul West and Gilbert Edge. He and Paul West collaborated to produce Billy Possum which was published in the Chicago Tribune from May 9 to July 11, 1909. According to American Newspaper Comics (2012), the Alphabet of Amiable Insects, a Sunday panel, was drawn by Taylor and written by Roy L. McCardell and published in the New York Press, from July 28 to August 18, 1901. 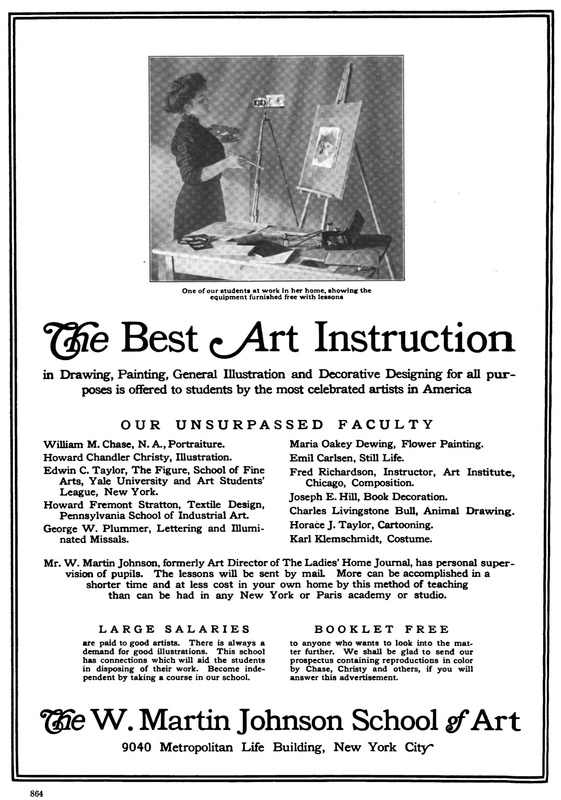 Advertisements in the Inland Printer, February 1909, Life Magazine, February 11, 1909, and The Fra, March 1909, said he was on the faculty of the W. Martin Johnson School of Art. 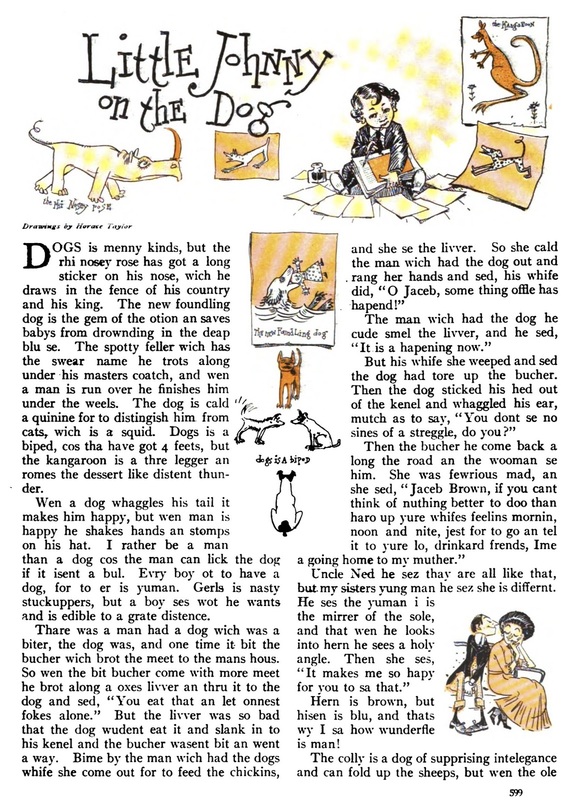 Taylor provided the child-like illustrations for the Little Johnny stories in Cosmopolitan Magazine; December 1908; 1909: March, April (below) and May. …The parade of fire fighters, cavalrymen, the fire engine, the stock brokers and things like that was merely a sort of ballyhoo before the big circus and side show that was to follow. And one mustn’t forget the lone representative from Scarsdale—Fireman Horace Taylor, illustrator and painter of Union Square,—who as the head of the Scarsdale Watercresses rode in state in a regular hired hack. According to the 1910 census, he was a resident of Scarsdale, New York, on Grand Boulevard. His occupation was artist. The Daily Argus (Mount Vernon, New York), September 11, 1913, said he lived in Arthur Manor neighborhood of Scarsdale. The Alumni Record (1913) said his studio address was 118 East Twenty-eighth Street, from 1905 to 1911. Taylor and his wife were recorded in the 1915 New York State Census, residing in Scarsdale. He was an illustrator and artist. In 1916, he worked in animation and produced four Toyland short films. He has not been found in the 1920 census. Taylor passed away September 17, 1921, in Wisconsin. His death was reported in the Sigma Chi Quarterly, November 1921. Horace Taylor, Kappa Kappa 1887, died at Eagle River, Wis., on September 17, 1921, of heart disease while on a fishing trip. Brother Taylor was for years a well-known newspaper cartoonist and artist in Chicago and New York. Several years ago while in New York he had a nervous breakdown and came to Highland Park, Ill., to live with his sister. Apparently he had recovered and was preparing to open a studio in Chicago. He was a member of the Press club of Chicago. Taylor was born October 7, 1865. He received his preparatory education at the University academy and later entered the University. From 1887-89 he was cartoonist for the Chicago Daily News and Record. He drew for the Chicago Herald from 1889 to 1896; New York Journal, 1896-1900; Verdict, 1900-1902. In the 1910 and 1920 censuses, Taylor’s sister, Augusta, lived in Nokomis, Illinois. According to the Illinois Death Index at Ancestry.com, she died January 13, 1921. It is not clear how long Taylor stayed with her. The American Art Annual (1921) said he died September 18, 1921 at Swamp Lake, Wisconsin. He should not to be confused with the British artist, Horace Taylor (1881−1934). Trying to get everyone together is harder with each passing year. Perhaps we can roast you this summer when the weather is warmer. If nothing else, Doralya and I will be down to visit once school gets out!